Order a FREE Ring Sizer today! When ordering from Danforth Diamond, we suggest that you order the correct ring size if at all possible, but if it HAS to be a surprise and you can't use any of our ring sizing methods we have provided on the site, below are some ideas that may help you make a pretty good guess. Ask her friends or relatives. If your girlfriend has any inkling that you may be proposing in the near future, she may have told them her engagement ring size. Does your girlfriend wear other rings? 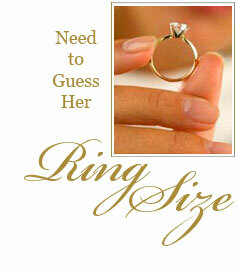 Use one of your girlfriends other rings to help you determine the perfect size engagement ring you need to purchase. Option 1 - When she's not around, temporarily "borrow" a ring that she wears on her left hand ring finger and trace the inner part of the ring on a piece of paper. Be sure to return the ring immediately and then match your tracing to one of the ring sizes on the printable ring chart available on our site. Or, match it to the FREE ring sizer that we will be happy to send you. Option 2 - Carry around a small bar of soap in your pocket. Hotel soap is the perfect size. When she's not around, press the ring into the soap to make an imprint. Be sure to wipe the soap residue off the ring and return it to its proper place. When you're alone, use our FREE ring sizer to match the imprinted circle. Option 3 - Take her ring and place it on one of your fingers. Draw a line around your finger where the ring falls. Use our FREE ring sizer to measure the marked area on your finger. Option 4 - Take the diamond ring and slide it down a tapered candle. Mark the candle where it falls, then use the FREE ring sizer to measure the marked candle. After you determine the ring size, browse our selection of affordable, quality diamond engagement rings.